Electric welding machines at one time were only made for industrial use. Modern technology has now made these electric welders a tool for not only small businesses but the homeowner as well. Some of these welding machines are the size of a 12-pack cooler that holds your favorite beverage and plug into the common wall socket of your home for it's power source. All electric welding machines perform the same function regardless of their size, they melt pieces of metal in order to mechanically bond them together. Electric welders are used extensively in all walks of industrial life, from the automobiles and trucks we drive to the refrigerators and stoves in our homes. The frames and bodywork of cars and trucks are welded together by robots. Stoves dishwasher and refrigerators are also constructed from metal frames that are melted together to make up the structure of these modern conveniences. All welders perform the same function. They output a low voltage alternating current called AC at a high amperage. The voltage range is from 24 to 50 volts AC while the current can be from 20 amperes to as high as 500 amperes. This high current can be seen as the blue arc of a welder. This arc heats up the metal to such a high temperature that it melts a puddle of molten metal. A filler material is used to fill in any gaps that occur from this melting process. The most common welder in industrial use is the arc welder. This type of electric machine uses a stick electrode to conduct the electricity to the work piece and melts at the same time to fill in the gaps. A wire feed machine uses a roll of wire that feeds through a tube to the work pieces to be joined together. The operator presses a button on a hand held torch and the wire feeds into the blue arc and fills in the gap between the two pieces of metal. A TIG welder or Tungsten Inert Gas machine uses a tungsten tip that creates the high temperature needed to weld aluminum together. Along with the arc, an inert gas such as argon is fed into the [TIG welding](https://homesteadycom/video-4426028-tig-welding-html) puddle of metal to remove any impurities from the surrounding environment. Homeowners and small shop operators alike can benefit from owning an electric welding machine. From repairing items around the home to small metal projects can bring great satisfaction. Although not constantly used, the affordability of these modern machines is a must have for the serious do-it-yourselfers. Looking into the blue arc of a welding machine can cause serious eye injury without the proper eye protection. 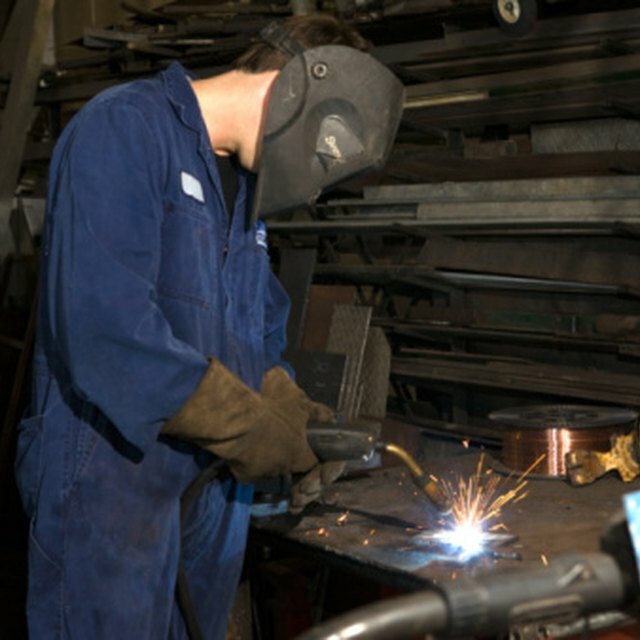 Protective clothing must also be worn when operating a welder as the high temperature and intensity of light created by the arc can cause severe "sunburn" on the any exposed flesh. How Do Lighting Ballasts Work? What Gauge Wire Is Used to Wire a Dryer Outlet? Why Is My Ice Not Dropping in My Ice Machine?